COUPONS: High Value $2 Off Dove Men+Care Deodorant Printable Coupon! 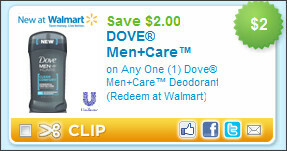 Coupons.com released a new coupon today for $2.00 off one Dove Men+Care Deodorant! This is a really high value coupon and will surely make a good deal if you wait for a sale! It is a manufacturer coupon, so you should be able to use it at any store (not just Wal-Mart). In fact . . . if your Kmart is super doubling this week (coupons up to & including $2), then this should be really cheap!